SharePad's portfolio functionality is modelled on SIPPs (Self Invested Personal Pensions) and Stocks & Shares ISAs (Individual Savings Account). As a result, it is necessary to credit portfolios with cash prior to recording any share purchases. A benefit of this approach is that you can accurate record your cash and investment positions in a single portfolio and monitor their performance accordingly. Credits and Debits can be recorded in any of the four transactions views - Holdings, Cash, Value on date or Tax. However, it is suggested that you do so via the Cash view - as you can see a record of the transaction once entered. To record a Credit, click on the pale green Add cash tran button at the bottom of the transactions screen and select Credit from the menu. Amount - expressed is in the default currency for the portfolio. Time - only really necessary if you are recording a purchase on the same date as the Credit. In which case you want to make sure the Credit is recorded at an earlier time to the Buy transaction. Note - an optional note. The Credit is the recorded as a Cash Credit in the Cash view and the balance of the portfolio cash is increased. When you record a Credit, SharePad will use this to calculate the performance compared to the benchmark displayed on your chart. In this example, the portfolio has been credited with the annual ISA limits for the last 6 years. 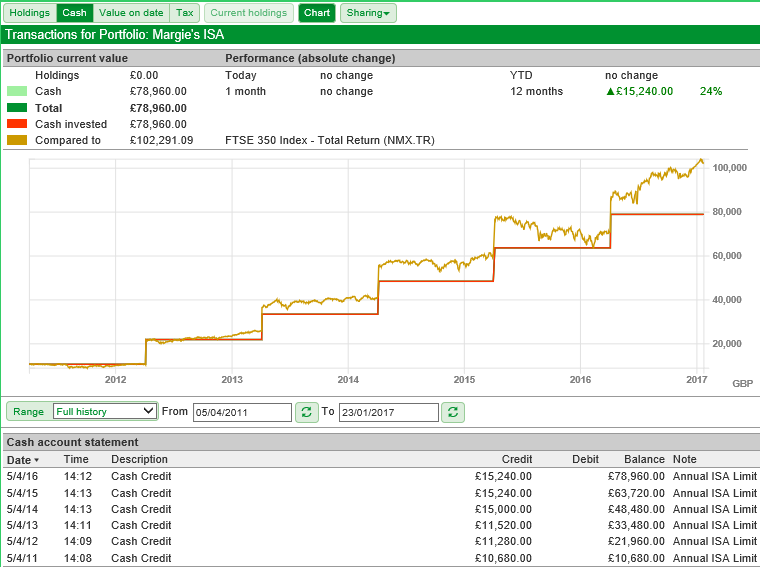 The red Cash Invested line steps up with each credit recorded in the account, and you can also see that the orange FTSE 350 Total Return index line steps up as each credit is used to invest in it. Recording a Debit transaction is much the same as a Credit. The only difference is that when you record a debit the cash balance of the portfolio is reduced.